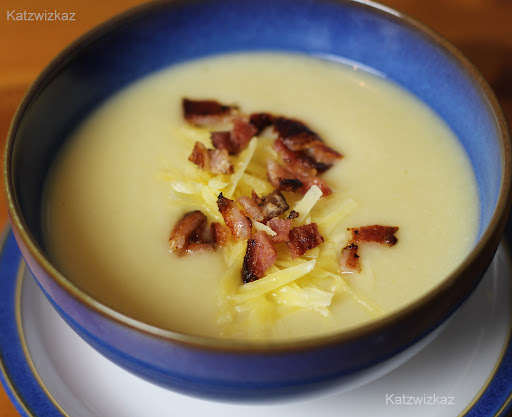 I make cauliflower cheese as a side dish for dinners, but never bothered with the idea of turning it into a soup, until I read fellow-food bloggers, Sharon and Magda‘s delicious sounding Cauliflower soup recipes a while ago, and am slowly getting around to trying those out. There are lots of recipes out there. Some have milk, some have cream, some have potato, and more have all of these! Variations are endless. So with the addition of some chopped streaky bacon, here is my version, which will serve 4. Using a stock pot, sauté the potato and onion in the oil on a low heat, until the onion is soft, and translucent. 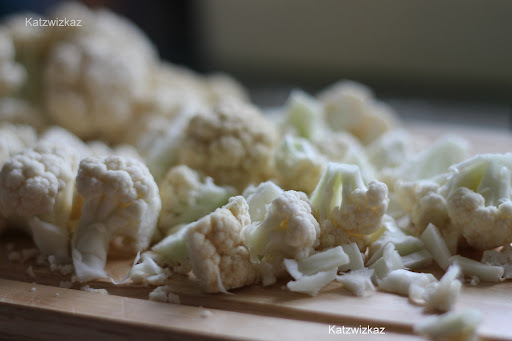 Add the florets of Cauliflower, not forgetting the stalks where you cut it from the core, as there is a flavour there too. Pour in your stock, bring back to the boil, then let it simmer for about 15 – 20 minutes, until the vegetables are cooked through. Check for seasoning throughout the cooking of the soup, and correct as you go along. Never be tempted to season all at once, as you can always add, but not take away! While the soup is simmering, fry the rasher of bacon, and chop finely. 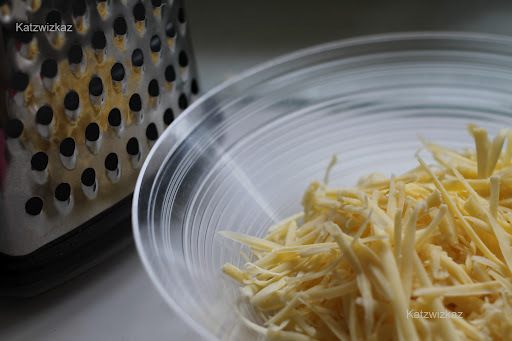 Next, grate the cheese and set aside. When the vegetables have cooked through, add some of the cheese, stir, and taste. Add as much, or as little at you like, but save some for a garnish. Using a Liquidiser or hand-held Stick Blender, blitz the soup, until smooth and creamy. Top with a little more cheese and a few pieces of the fried bacon. Serve with some crusty bread. My Spelt rolls would be a perfect accompaniment. I do a cauliflower with blue cheese…. 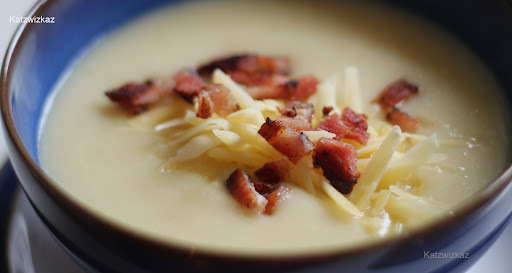 but of course love this with crispy bacon! Must try! I like your thinking! Am thinking the same… a couple of streaky rashers…. emmm! Thank you for mentioning me. A cauliflower soup is lovely isn't it? And so simple. I should make a soup more often. No problem, Magda, a great recipe deserves a mention. I should really make more too. This soup is simple and sounds really good. I'll have to give it a try. It really is, Greg, just a few ingredients, and it's a really filling lunch dish. Looks utterly delicious – love the crispy bacon on top! Margaret, he flavour of your own rashers cannot be beaten, and would be great with this.